sklad is a simple personal warehouse management system or, let's rather say, "stuff management system", employing a web UI for easy mobile access from a smartphone. 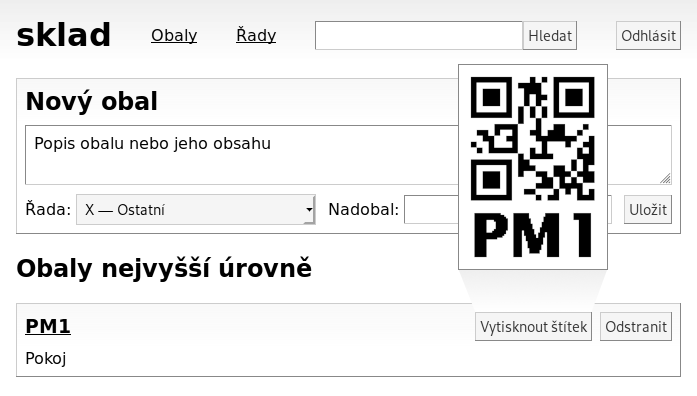 The templates are currently localised only in the Czech language. The project also contains reusable Go packages with a Brother QL-series USB printer driver and a simple BDF bitmap font renderer, as well as a few related utilities for previewing, printing and debugging. Decent Unicode fonts in the BDF format can be obtained from https://www.cl.cam.ac.uk/~mgk25/ucs-fonts.html though they will need some upscaling because of the printer's high DPI. Use https://git.janouch.name/p/sklad to report any bugs, request features, or submit pull requests. git send-email is tolerated. If you want to discuss the project, feel free to join me at ircs://irc.janouch.name, channel #dev.